An acute bacterial disease that usually affects the skin, but which may very rarely involve the oropharynx, mediastinum or intestinal tract. In cutaneous anthrax, itching of an exposed skin surface occurs first, followed by a lesion that becomes papular, then vesicular and in 2-6 days develops into a depressed black esehar (see picture). The esehar is usually surrounded by moderate to severe and very extensive edema, sometimes with small secondary vesicles. Pain is unusual and, if present, is due to edema or secondary infection. The head, forearms and hands are common sites of infection. The lesion has been confused with human orf (i.e., Orf virus disease). Untreated infections may spread to regional lymph nodes and to the bloodstream with an overwhelming septicemia. The meninges can become involved. Untreated cutaneous anthrax has a case-fatality rate of between 5% and 20%, but with effective antibiotic therapy, few deaths occur. The lesion evolves through typical local changes even after the initiation of antibiotic therapy. Initial symptoms of inhalation anthrax are mild and nonspecific and may include fever, malaise and mild cough or chest pain; acute symptoms of respiratory distress, x-ray evidence of mediastinal widening, fever and shock follow in 3-5 days, with death shortly thereafter. Intestinal anthrax is rare and more difficult to recognize, except that it tends to occur in explosive food poisoning outbreaks; abdominal distress is followed by fever, signs of septicemia and death in the typical case. An oropharyngeal form of primary disease has been described. Laboratory confirmation is made by demonstration of the causative organism by microscopy in blood, lesions or discharges by direct polychrome methylene blue (M'Fadyean) -- stained smears or by culture or inoculation of mice, guinea pigs or rabbits. Rapid identification of the organism by using immunodiagnostic testing, ELISA and PCR may be available in certain reference laboratories. Cutaneous anthrax, the most common form, is usually curable. A small percentage of cutaneous infections become systemic, and these can be fatal. Systemic infection resulting from inhalation of the organism has a mortality rate approaching 100 percent, with death usually occurring within a few days after the onset of symptoms. The rate of mortality among persons with infection resulting from ingestion is variable, depending on the outbreak, but it may also approach 100 percent. Whatever the portal of entry, systemic anthrax involves massive bacteremia and toxemia with nondescript initial symptoms until the onset of hypotension, shock, and sudden death. Manifestations of advanced disease, including shock and sudden death, are believed to result from the action of the exotoxin complex secreted by anthrax bacilli. The efficacy of therapy, if initiated during the incubation period, and the rapid course of the disease once symptoms appear make early intervention an absolute necessity. Inhalational anthrax is usually fatal, even with aggressive antimicrobial therapy. It appears that only about one fifth of those who contracted inhalational anthrax in Sverdlovsk (where an accidental exposure of 66 persons took place) recovered. 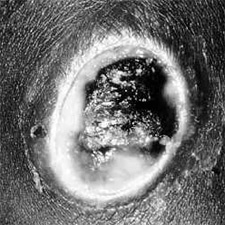 Anthrax spores are about 1 to 2 µm in diameter, a size that is optimal for inhalation and deposition in the alveolar spaces. Although the lung is the initial site of contact, inhalational anthrax is not considered a true pneumonia. 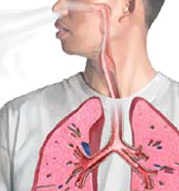 In most but not all cases, there is no infection in the lungs. Rather, the endospores are engulfed by alveolar macrophages and transported by them to the mediastinal and peribronchial lymph nodes, with the spores germinating en route. Anthrax bacilli multiply in the lymph nodes, causing hemorrhagic mediastinitis, and spread throughout the body in the blood. Source: Dixon TC, Meselson M, Guillemin J, and Hanna PC. Anthrax. New England J Medicine 341, 815-826, 1999. Laboratory detection and analysis of B. anthracis is done with the following tests. Cultures. Culturing, or growing, anthrax bacteria is relatively simple, but does take some time. First the sample is plated, or placed, onto a laboratory petri dish containing a solid layer of gelatin, called agar, which contains nutrients for the bacteria to grow. Once plated, it takes 18 to 24 hours before the bacteria have grown enough to be analyzed. Scientists then study the bacteria that have grown on the plates. PCR: Polymerase Chain Reaction. PCR allows scientists to amplify, or create copies, of small amounts of anthrax DNA into quantities large enough to analyze. The process only amplifies the specific DNA that you are looking for. This test can be done quickly in the field to determine if anthrax is present, and also again more thoroughly in the lab to determine if the bacteria contains specific genes, such as ones that might make the bacteria antibiotic-resistant. Antibody tests. These tests indicate if your body has begun to fight off infection. One such test, sometimes called an ELISA, indicates if your body has produced antibodies against the anthrax bacteria. When you become infected with anything your body produces antibodies that help fight off the infection. If you have antibodies against the anthrax bacteria, and you were never exposed to it before, it would indicate that you are infected. Microscopy. Anthrax bacteria have many distinguishing physical characteristics that scientists use to identify them from other types of bacteria under the microscope. For example, the anthrax are shaped like small rods, are non-motile, meaning they do not move around on their own, and are can be stained by certain dyes. DNA fingerprinting. This test is usually done after all the others to find out the specific type of anthrax bacteria involved. By closely scrutinizing the bacteria's DNA, scientists can determine if two anthrax samples originate from the same strain. For fingerprinting, labs use PCR technology as well as other genetic techniques to study bacterial genes. Each bacterium has its own unique DNA fingerprint. By sequencing certain genes scientists can compare samples to an existing library of anthrax bacteria sequences. Figuring out where a bacterium came from can very difficult, especially if it turns out to be a strain commonly found in research institutions. Source: Johnson T. ABC News, October 19, 2001.